As stories from new volunteers come in each month, we will add them, so please continue to check back for updates. 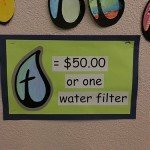 On the Rainier Christian School’s Maple Valley Elementary campus, February was “Missions Month.” During the Kick-Off Chapel, 100 students from kindergarten through sixth grade learned about the lack of safe drinking water in impoverished countries and how the Water for Life Charity campaign could help. By participating in a Mini-Walk 4 Water Walk-a-Thon that lasted 30 minutes, students started their own fundraising campaign. 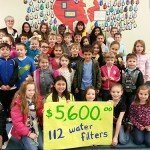 Sponsored by the Teacher/Parent Fellowship group from Maple Valley Elementary, students raised enough money to purchase their first water filter. The next challenge was to walk or run, as well as get involved with a month-long Walk 4 Water Walk-a-Thon event, with students asking for parents and other relatives as well as friends to sponsor. Throughout the entire month, students participated in the Walk-a-Thon and completed additional chores to make money, such as cleaning out closets, weeding lawns, and selling toys for cash. In addition, since they live in Seahawks country, students even set out collection jars at Super Bowl parties to collect change from family, friends and football fans. Every week as the donations were counted, it seemed that the total amount was doubled. 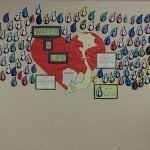 Including the matched funds offered by the Boeing Company, the school donated $6,343.50 to Water for Life Charity. Because of their efforts, families in Vietnam and Cambodia will receive 126 Sawyer water filters for clean and safe drinking water. The filters, along with the message of Jesus’ unwavering love, will directly help save the lives of hundreds of people. Being a part of God’s big plan is joyous. We hope you are inspired and will work alongside with the Water for Life Charity teams. 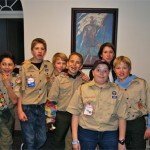 While working on his Eagle project for Boy Scouts, Josh Walters wanted to teach people about the importance of water and donating for water filters to help save the lives of people living in Uganda. At church, Josh gave a presentation and demonstration of the Sawyer water filter, thus educating more than 50 people about waterborne diseases. Josh explained how this gravity-fed filter is capable of filtering as low as 0.1 microns, thus eliminating diseases like salmonella, E. coli, giardia, and hepatitis A. He also felt it was important to talk about emergency preparedness, stressing that emergencies happen everywhere. Josh also demonstrated how nearly black water can be transformed into perfectly clear water by using the filter. One woman in attendance was skeptical, so Josh had his mother drink the clean water. 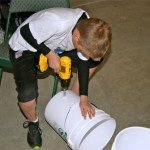 After the presentation and demonstration ended, Josh began filling water filter orders. He ordered the filters, got 5-gallon buckets with lids, drilled holes on the bottom for the filters, and then taped over the openings to prevent dirt from getting inside. After adding the sticker containing the instructions, he delivered the kits to everyone who placed an order. Josh admitted that he had no idea how many filters people would actually order. 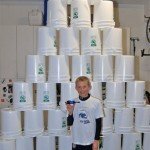 He hoped his efforts would at least spread the word about Water for Life Charity and that perhaps people would order a filter for emergencies. Through his efforts, 52 families got help and 34 filters were sent to the Water for Life Charity Uganda team.